As with my Minecraft Creeper Blanket Pattern, I wrote this pattern years ago — July of 2007, to be precise. It is actually the first knitting pattern I ever wrote. When I took down my old blog, the patterns went with it, and since then I have had request to re-publish some of my old work. My Ribbed For Her Pleasure Sock Pattern is a very simple sock that, due to its repetitive nature, is great for working on in front of the TV, while on the bus, or while watching small children. 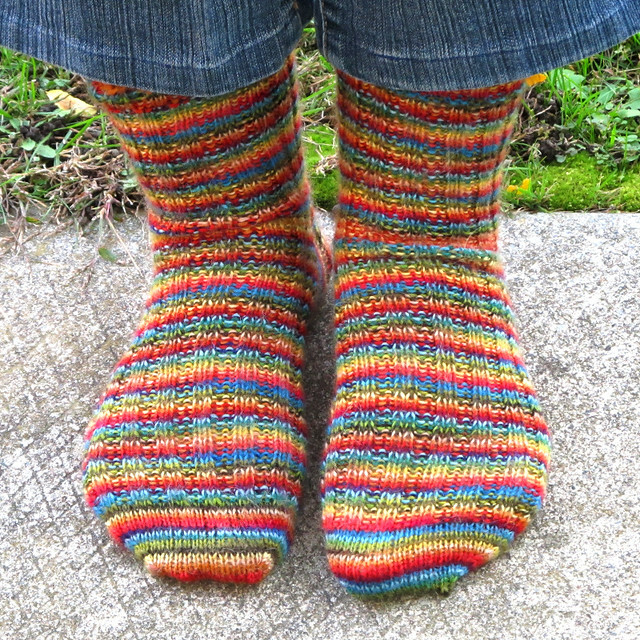 It works well with most sock-weight yarns and showcases self-striping yarns beautifully. This is the updated version from 2011, when I fixed an error in the heel. – Loosely cast on 60 sts. Divide into 20 sts on 3 needles. Join and work in (K2, P2) ribbing for 1.5″ (3.81cm). 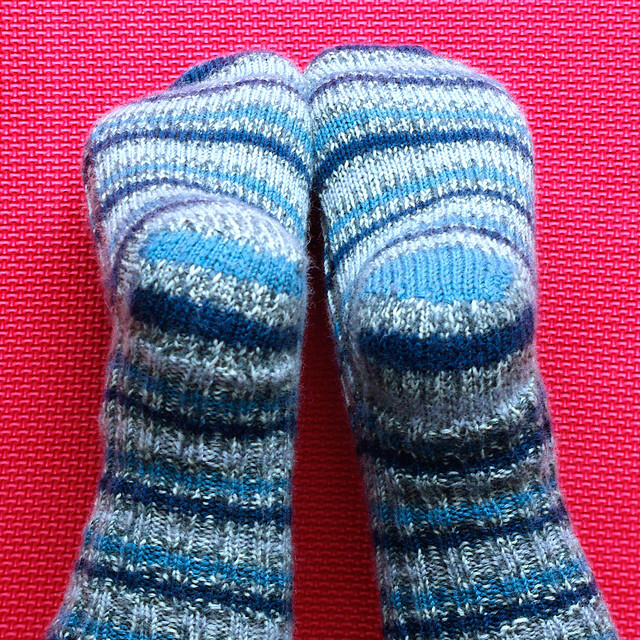 – Work in (P2, K2) for an additional 3.5″ (more or less if taller or shorter socks are desired; make sure you have additional wool if you want taller socks). – Slip 6 sts from end of 1st needle onto beginning of 2nd needle, and slip 6 sts from beginning of 3rd needle onto end of 2nd needle. This should give you 14 sts on the 1st needle, 32 sts on the 2nd needle, and 14 sts on the 3rd needle. – Divide the 32 sts on the 2nd needle onto two needles of 16 sts each and leave for the instep. – 1st row: (RS) K1. Slip 1. Repeat across row ending row with K1. – 2nd row: K1. Purl to last stitch. K1. – Repeat these two rows for 2 inches, ending with 1st row. – 1st row: (WS) Slip 1. P14. P2tog. P1. Turn. – 2nd row: (RS) Slip 1. K5. SL1. K1. PSSO. K1. Turn. – 3rd row: Slip 1. P6. P2tog. P1. Turn. – 4th row: Slip 1. K7. SL1. K1. PSSO. K1. Turn. – 5th row: Slip 1. P8. P2tog. P1. Turn. – 6th row: Slip 1. K9. SL1. K1. PSSO. K1. Turn. – 7th row: Slip 1. P10. P2tog. P1. Turn. – 8th row: Slip 1. K11. SL1. K1. PSSO. K1. Turn. – 9th row: Slip 1. P12. P2tog. P1. Turn. – 10th row: Slip 1. K13. SL1. K1. PSSO. K1. Turn. – 11th row: Slip 1. P14. P2tog. Turn. – Slip 32 sts for instep onto one needle. – 1st needle: With RS of work facing and using the heel needle, pick up 13sts. Knit 11 of these sts, then purl 2 of these sts. – 2nd needle: Slip the two purled stitches from the end of the 1st needle to the beginning of the 2nd needle. (K2, P2) the rest of the way across instep sts. – 3rd needle: Pick up and knit 13 sts along other side of heel. – Knit 7 sts from beginning of first needle onto end of 3rd needle. – 1st needle: Knit to last 3 sts. K2 tog. K1. – 2nd needle: (P2, K2) to the end of needle, ending with P2. – 3rd needle: K1. Slip 1. K1. psso. Knit to end. – Repeat these two rounds to 13sts on 1st needle, 34 sts on 2nd needle, and 13 sts on 3rd needle (60 sts total). – Slip 2 sts from start of 2nd needle onto end of 1st needle, and slip 2 sts from end of of 2nd needle onto start of 3rd needle. This should give you 15 sts on the 1st needle, 30 sts on the 2nd needle, and 15 sts on the 3rd needle. – 1st needle: Knit to last 3 sts. K2tog. K1. – 2nd needle: K1. Slip 1. K1. psso. Knit to last 3 sts. K2tog. K1. – Repeat these two rounds until 28 sts remain (divided 7-14-7). Break yarn and graft 2 sets of 14 sts. Posted on March 24, 2017 March 23, 2017 by owntwohandsblogPosted in Knitting, PatternsTagged crafts, gifts, Knitting, Patterns, yarn. This is a great pattern! I have made several and live them! Easy to follow, great for, and perfect for beginners!